See OASIS Guidance Manual for a complete list of relevant ICD-10 codes. This item identifies whether two specific diagnoses are present, and active. These diagnoses influence a patient's functional outcomes or increase a patient's risk for development or worsening of pressure ulcer(s). 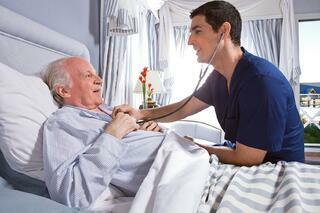 This section identifies active diagnoses that are associated with a patient’s home health episode of care. Identify diagnoses: The diseases and conditions in this item require a physician (or nurse practitioner, physician assistant, clinical nurse specialist, or other authorized licensed staff if allowable under state licensure laws) documented diagnosis at the time of assessment. - Medical record sources for physician (or nurse practitioner, physician assistant, clinical nurse specialist, or other authorized licensed staff if allowable under state licensure laws) diagnoses include, but are not limited to, transfer documents, physician progress notes, recent history and physical, discharge summary, medication sheets, physician orders, consults and official diagnostic reports, diagnosis./problem list(s), and other resources as available. - Available documentation may be limited at admission/start of care. Admission/start of care assessment may indicate symptoms associated with one of this item’s listed conditions while a documented diagnosis is not present in available records. The clinician should contact the physician (or other, as listed above) to ask if the patient has the diagnosis. Once a diagnosis has been identified, determine if the diagnosis is active. - Although open communication regarding diagnostic information between the physician and other clinical staff is important, it is also essential that diagnoses communicated verbally be documented in the medical record by the physician (or nurse practitioner, physician assistant, clinical nurse specialist, or other licensed staff if allowable under state licensure laws) to ensure follow-up and coordination of care. Diagnostic information, including past medical and surgical history obtained from family members and close contacts, must also be documented in the medical record by the physician (or nurse practitioner, physician assistant, clinical nurse specialist, or other authorized licensed staff if allowable under state licensure laws) to ensure validity, follow-up and coordination of care. Only diagnoses confirmed and documented by the physician (or nurse practitioner, physician assistant, clinical nurse specialist, or other authorized licensed staff if allowable under state licensure laws) should be considered when coding this item. Determine whether diagnoses are active: Once a diagnosis has been identified, determine if the diagnosis is active. Active diagnoses are diagnoses that have a direct relationship to the patient’s current functional, cognitive, mood or behavior status; medical treatments; nurse monitoring; or risk of death at the time of assessment. Do not include diseases or conditions that have been resolved or do not affect the patient’s current functional, cognitive, mood or behavior status; medical treatments; nurse monitoring; or risk of death at the time of assessment. Medical record sources to identify active diagnoses at the time of assessment include, but are not limited to, transfer documents, physician progress notes, recent history and physical, discharge summary, medication sheets, physician orders, consults and other official diagnostic reports, diagnosis/problem list(s), and other resources as available. - Only diagnoses confirmed by the physician (or nurse practitioner, physician assistant, clinical nurse specialist, or other authorized licensed staff if allowable under state licensure laws) that are active should be coded on the OASIS Data Set. In the next blog post we will cover how to accurately and thoroughly respond to this question using best practices so check back again this week for more useful information!